“The Kingdom of Heaven is like a grain of mustard seed, which a man took, and sowed in his field; which indeed is smaller than all seeds. But when it is grown, it is greater than the herbs, and becomes a tree, so that the birds of the air come and lodge in its branches.” Thus says the Bible about the humble beginnings of the great mustard plant. “Sarson” (mustard) is central to North Indian culture. The yellow mustard flower is the symbol of spring. Songs on the theme of sarson are an integral part of regional folk culture. ‘Sarson ka tel’, “Shorsher Tel” or Mustard oil is the olive oil of Northern and Eastern India. If Bengalis swear by their fish cooked in mustard oil and Biharis cannot make their bajkas or chokha and jhalmuri without it, there is a deeper reason behind it than the tangy taste of mustard oil. Mustard is not just an edible oil. It is an important medicine in the indigenous Ayurvedic system of healthcare. It is used for therapeutic massages, muscular and joint problems. Oil with garlic and turmeric is used for rheumatism and joint pains. Mustard oil is also used as a mosquito repellent. 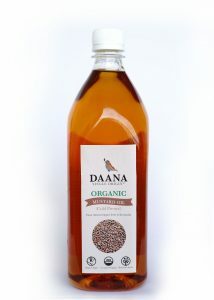 Daana’s mustard seeds come from Annaveerappa’s family owned organic farm in Korwar, Karnataka. The oil is extracted using the rotary press method, by the ghani at the Oil Collective, in Bangalore. Used as a spice, condiment, herb, cooking oil and medicinal agent, the Mustard plant has been discovered in excavations in the Indus Valley civilizations, as early as 1800 BC. Mustard was first considered a medicinal plant rather than a culinary one. 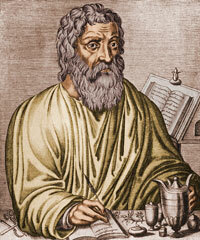 In the sixth century B.C., Greek scientist Pythagoras used mustard as a remedy for scorpion stings. A hundred years later, Hippocrates used mustard in medicines and poultices, and mustard plasters were applied to treat toothaches. Pope John XII was so fond of mustard that he created a new Vatican position—grand moutardier du pape (mustard-maker to the pope), and promptly filled the post with his nephew 🙂 His nephew was from the Dijon region, which soon became the mustard center of the world. 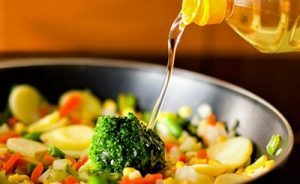 Mustard oil has been a part of North and East Indian cooking for a long time and features in the customs of the Bengali and Punjabi communities in India. 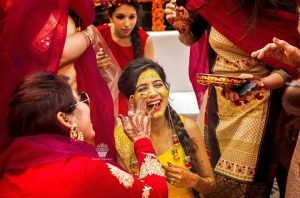 During their weddings, the groom and the bride are given a ritual bath of sandalwood paste and mustard oil. It is routinely used in the winter months as a massage oil to keep the body warm. The thirteenth century sufi saint Hazrat Nizamuddin was devastated at the untimely death of his nephew. His disciple Amir Khusro, saw some village women carrying flowers of the “sarson” to a nearby temple, dancing and celebrating spring. He composed this qawwali “Phool rahi sarson sakal ban” to make his guru smile. Nizamuddin overcame his grief and smiled, and ever since, Basant Panchami is celebrated at his hermitage every year with lots and lots of sarson ke phool (mustard flowers). Listen to it being rendered by Ustad Munshi Raziuddin. Monsanto and the “Mustard Oil Tragedy”: In July 1998, protests erupted across India when the government announced plans to import 1 million tons of US soybeans to be used as oil seeds. Critics complained that there was no guarantee that these shipments would not be contaminated with genetically engineered (GE) soybeans. Besides, the Agriculture Ministry argued, the imports were unnecessary: India already had an abundant source of edible oils right here at home–mustard seed oil. Mustard seed can be processed locally, making it available to the poor at low cost. It is an integral part of India’s food economy, having been integrated into cropping patterns over the centuries. Clearly, as long as India had mustard seed, there was no market for US soybeans. In early August 1998, an unparalleled mass-poisoning tragedy began to unfold in Delhi. The authorities determined the illnesses were caused by the adulteration of mustard oil with seeds of a weed called Argemone mexicana–as well as diesel oil and industrial wastes. The symptoms included swelling of the feet, nausea, vomiting, diarrhea, abdominal swelling, liver toxicity, kidney damage, breathlessness due to retention of fluids in the lungs and death due to heart failure. By early September, the official death toll was 41, and 2,300 people had been affected. The government then banned the sale of all unpackaged edible oils, thus ensuring that all household and community level processing of edible oils was stopped. It simultaneously announced a policy to import foreign soybeans free of protective trade tariffs. The justification was the mustard oil tragedy. With this edict, edible oil became fully industrialized. This in effect was the total destruction of the economy of unpackaged oil. It placed a heavy burden on the poor, who depended on it since it was cheaper and could buy it in small quantities. Because the US has been unable to sell its soy to Europe (owing to consumer rejection of GE soybeans and a demand for labeling all GE foods) it was desperate to dump its GE soy on countries like India. The mustard oil tragedy thus served as a perfect “market opening” for US agribusiness corporations. If traders cannot sell mustard oil, they will not buy mustard from farmers, and farmers will stop growing mustard. This will lead to the extinction of a crop that is central to our farming system and food culture. Ironically, Calgene (now owned by Monsanto) has patented the Indian mustard seed. Therefore we could find ourselves dependent on Monsanto’s patented mustard seeds. To add insult to injury, the Indian government is now considering introduction of (genetically modified) GM Mustard into the country. Read more about the resistance to it from activists and civil society, called Sarson Satyagraha. We do hope public pressure, and common sense will overturn these corporate and political pressures, just like they did with GM Brinjal. Mustard Oil has a unique clangy bite to it, and nothing highlights it more than a simple Bengali stir fried curry with vegetables. Enjoy making the “Labra-Torkari” that is served with Khichdi during the Durga Puja Bhog.